If you have a child in their first year of primary school, there is a good chance you will have come across the word ‘Phonics’. Phonics is a method of learning to read words that is taught right from the start of Reception. Children are taught to read letters or groups of letters by saying the sound(s) they represent – so, they are taught that the letter l sounds like llll when we say it. Children can then start to read words by blending the sounds together to make a word. Here, our phonics experts share their top tips on how best to help with phonics, and Laura Sharp tells us about the Phonics Screening Check that children take at the end of Year 1. We’ve also included a helpful audio guide that will help you learn how to say the 44 phonics sounds correctly, and books to help practise reading with phonics at home. Watch this fun animated introduction to learning to read using phonics. Watch Ruth Miskin's top ten tips for getting started with phonics. sounds would you like to hear spoken aloud and in example words? 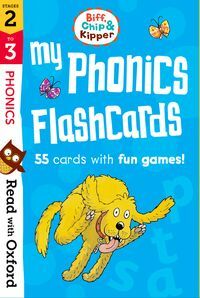 put reading with phonics into practice. Read Laura Sharp's FAQs about the Year 1 phonics screening check. Perfect preparation for the Year 1 phonics check. Practise reading with our free levelled phonics eBooks. 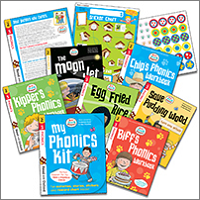 Browse our phonics books and activity kits.